To say that I was not impressed with the first 4K LED TVs I saw in March 2016 would be a gross understatement. I thought they were an abomination. They were a quadruple abomination compared to the wide viewing angles, deep blacks, and depth of field that I enjoyed at home with my then 7 year old 60" Pioneer Elite Kuro PRO-151FD plasma TV. Sure, 4K sets offered more detail and more vivid colors, but the picture quality looked so cartoonish and unrealistic to me. I would get eye fatigue after just a few minutes of watching. With that said, I did believe the technology had merit. I just thought it would be a very long time, perhaps five years or so, until the implementation of the technology was good enough to be a viable replacement for plasma. On my home theater system, I could see that a 2K Blu-ray movie mastered in 4K and converted to 2K had better picture quality than a 2K Blu-ray mastered in 2K. I began buying 4K UHD movies in September 2018. I found that I preferred watching a down-converted UHD movie rather than its 2k version. I purchased my first 4K OLED TV, an LG OLED55E8PUA, for my home office in December 2018. 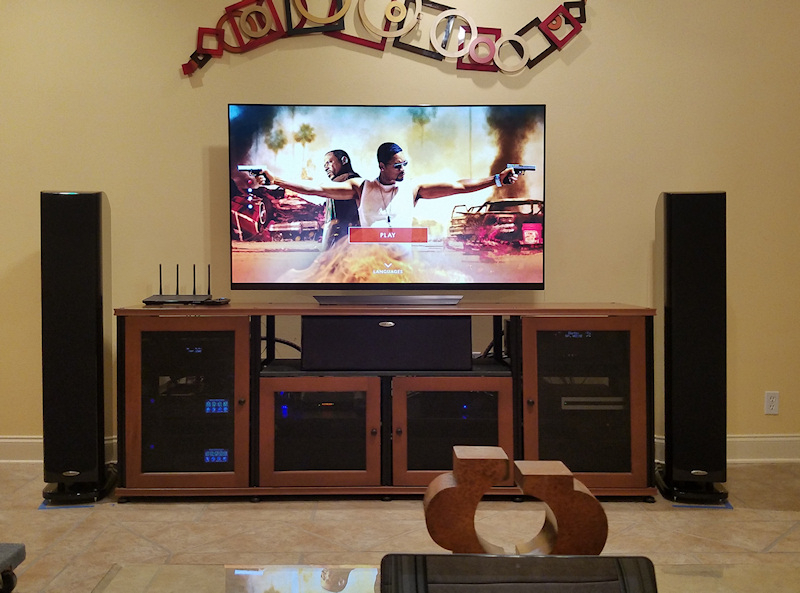 In January of 2019, I purchased a second LG OLED55E8PUA for my master bedroom and a 65" OLED65E8PUA to replace the 60" Kuro plasma in my home theater. The 55" OLEDs replaced two Samsung HP-S4273 42" plasmas. Figure 1. Fond memories...from the glory days of Kuro plasma. Figure 2. Low hours! Kuro usage hours just prior to being decommissioned after 9.5 years of service. 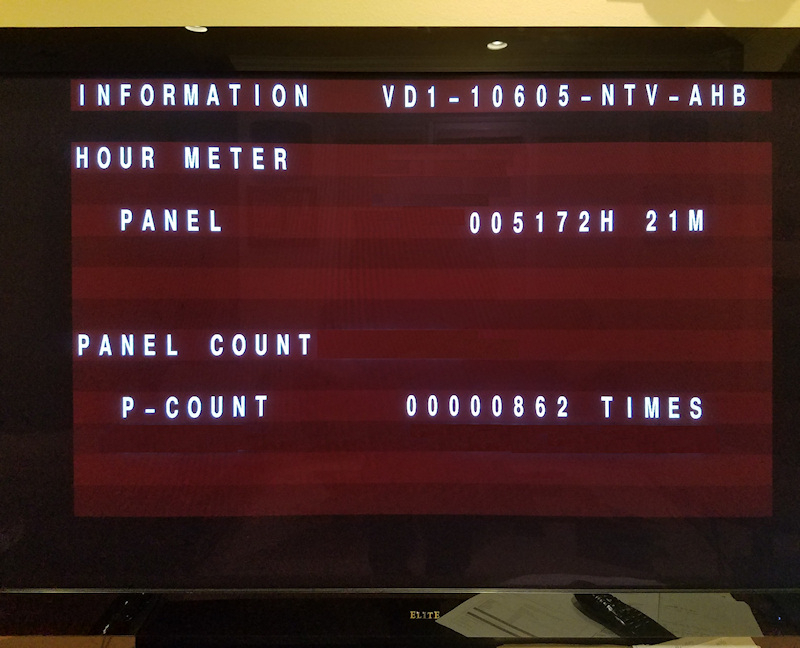 From July 2009 to January 2019, a total of 5172 hours were logged and the TV was turned on 862 times. That averages to a little less than 1.5 hours per day and being turned on an average of 91 times a year. The TV was used mostly for watching movies. A friend is interested in buying my Kuro. The problem is that his wife does not like large TVs. She does not like anything over 40". We'll see how this plays out. Figure 3. The former king of my home theater being trucked away prior to the new prince arriving. I say "prince" because I actually wanted a larger 77" LG OLED, but what I wanted does not exist...yet. I prefer the aesthetics, build quality, and sound quality of LG's "E8" series OLEDs. However, they do not make a 77" E8 because it would be prohibitively expensive at this time. They do make a 77" in the C8 series, and it is significantly more expensive (by several thousand dollars) than the C8 65 inch model. This is true of both MSRP and street prices. The price differential between the 55" and 65" models is commensurate with the increase in panel size. The wide disparity between the 77" and 65" sizes is due to the fact that current factories are not set up to efficiently produce panels larger than 65". There is a lot of material waste. When the new 10th generation OLED plants, which are optimized for large panel production, begin operation by mid 2020, there should be a drastic reduction in large panel OLED prices. I expect that LG will then offer a 77" (or larger ) OLED that will have a more linear cost differential with the smaller size panels. That's why the 65" OLED, as spectacular as it is, is just a stop gap, a place holder, a proxy, a "prince", until the real king arrives. The 2018 model LG OLED TVs were the first sets that caused me to think that I wasn't giving up anything by transitioning away from plasma. Figure 4. Stopgap OLED. The 65" OLED screen is 12.5% larger than the former 60" Kuro, but I wanted to go 60% larger with a 77" model. Figure 5. Dream image of what a 77" LG E8 would look like in my home theater...if it existed. The first 55" OLED was set up in my home office. 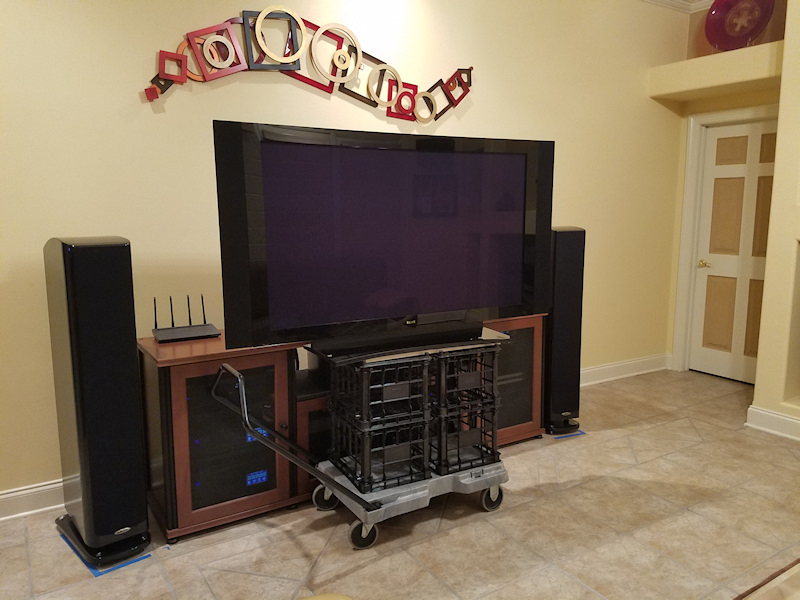 This was my 4K "testbed" for experimenting with settings, cables, and accessories prior to replacing the other two plasma TVs. Figure 6. Screen size comparisons. The wall behind the 55" OLED has taped areas representing the screen sizes of the 60" Kuro plasma, 65" OLED, and 77" OLED. 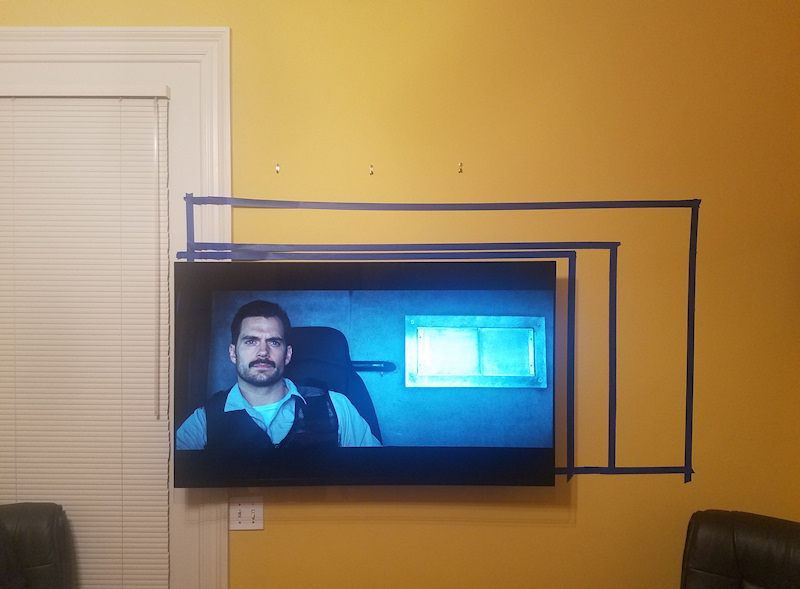 While watching a movie on the 55", the taped areas helped me imagine what I would be gaining with larger screen sizes. Figure 7. My initial attempt to watch a UHD movie was met with failure. However, this was not the TV's fault. It was the fault of a long HDMI cable run with many signal loss points. After trying different settings, I found that UHD movies would play if deep color was turned off. I sent an inquiry to Oppo and to LG describing the problem. LG quickly responded by asking me why I had deep color turned off and that I should have deep color turned on. Oppo was much more helpful. They suggested that the long HDMI cable run was the problem. They asked me to connect the UDP-203 player directly to the TV with the premium certified HDMI cable that came with the player. Sure enough, the issues with deep color transmission went away. Oppo further advised that, if I needed to keep the long cable run, I should try premium certified HDMI cables. 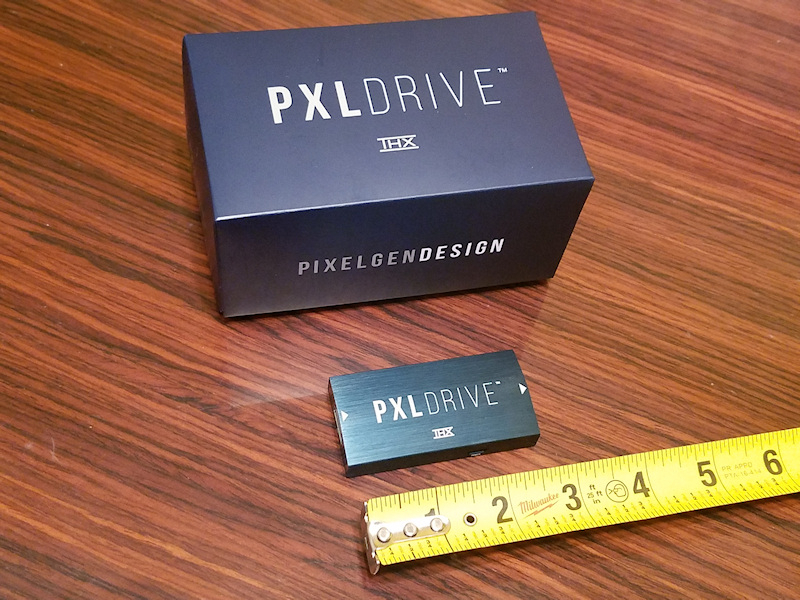 They also suggested an HDMI signal amplifier/equalizer, the PxlDrive ($299), made by Pixelgen Design of Canada. UDP-203 player ==> Twisted Veins right angle adapter ==> 25 feet of Twisted Veins HDMI cable running inside a baseboard conduit along two walls ==> General Electric HDMI/F-connector wallplate ==> Twisted Veins right angle adapter ==> 6 feet of Twisted Veins HDMI cable running inside the wall ==> Twisted Veins right angle adapter ==> General Electric HDMI/F-connector wallplate ==> Twisted Veins right angle adapter ==> 3 feet of Twisted Veins HDMI cable ==> Twisted Veins right angle adapter ==> TV. Running the individual 25', 6', and 3' Twisted veins cable segments from the player to the TV worked. Using a right angle adapter on both ends of a single cable worked. Having a wall plate between two cable segments didn't work. 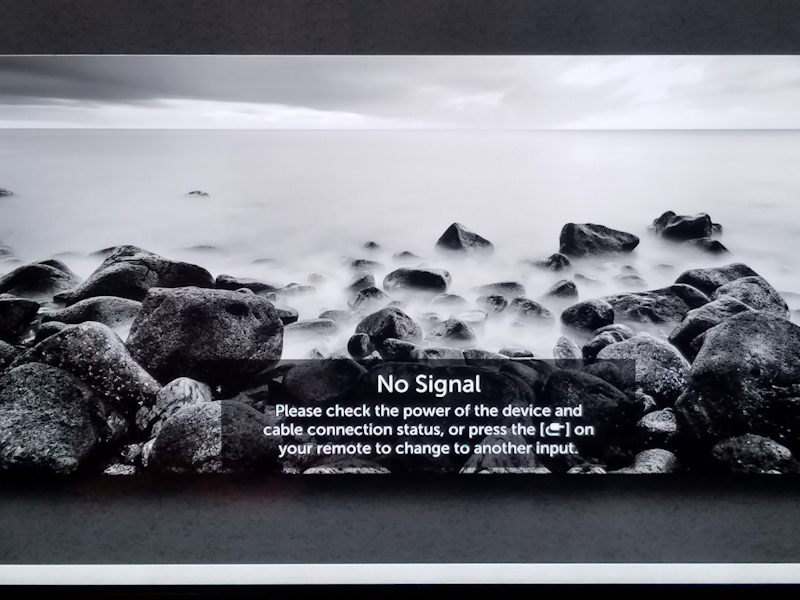 I was apparently getting major signal loss through the General Electric wallplate HDMI connectors. Figure 8. PxlDrive THX certified 4K HDMI interconnect dongle. The PxlDrive is placed at the TV end of a long HDMI cable run and is claimed to work up to 15 meters (49.5 feet). 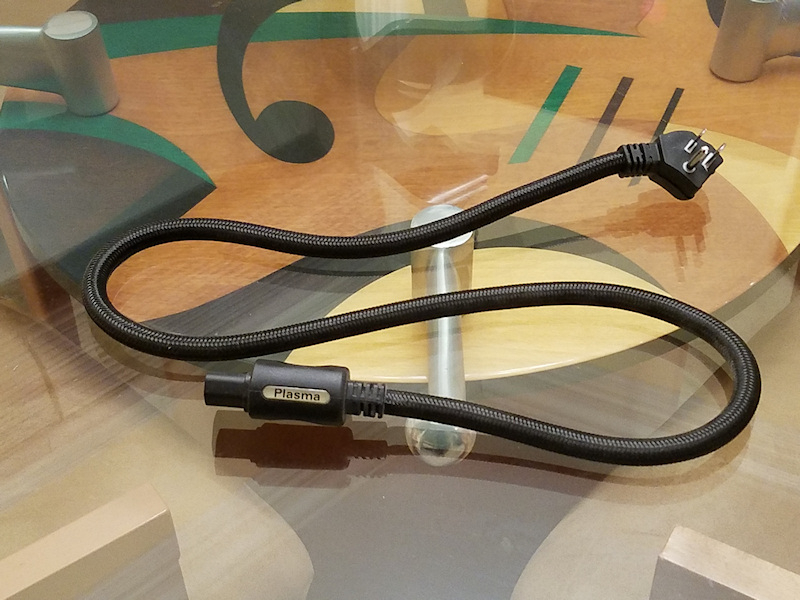 The PxlDrive adds an additional 1 meter (3.3 feet) to the HDMI cable chain. 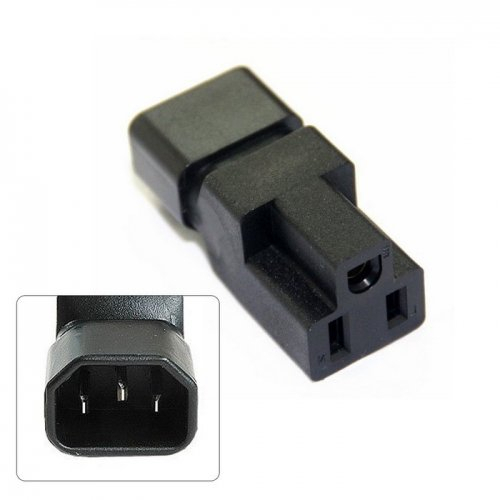 The PxlDrive's cable must be used between the PxlDrive and the TV. Figure 9. 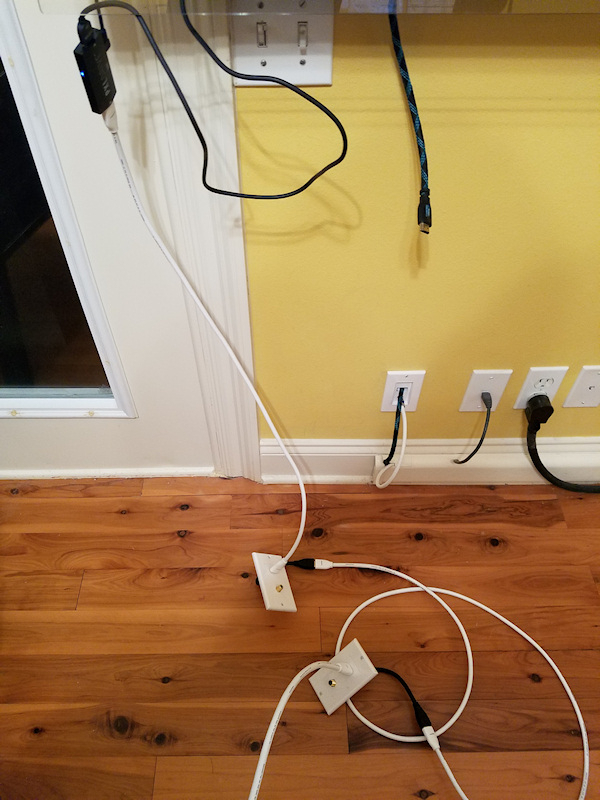 The HDMI cable chain was duplicated outside of the wall and baseboard conduits. This cable run was 37.3 feet long with the PxlDrive's cable. The white blocks are the HDMI couplers removed from the General Electric HDMI/F-connector wall plates. 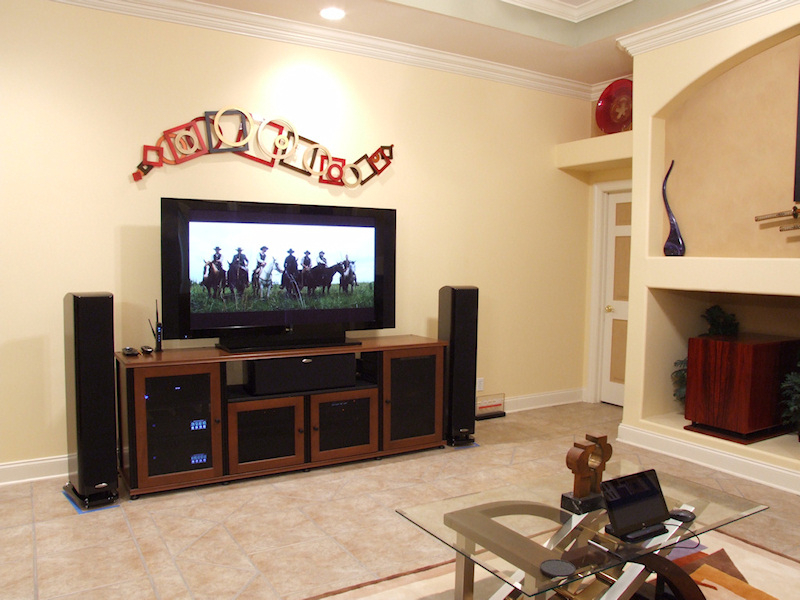 The GE wall plates were installed in 2006, ten years before 4K became commercially available for home entertainment. Figure 10. Acting on Oppo's advice, I invested in some premium certified HDMI cables. The wallplates are by Yomyrayhu and are claimed to support 4K, but are not 4K certified. However, they worked very well. 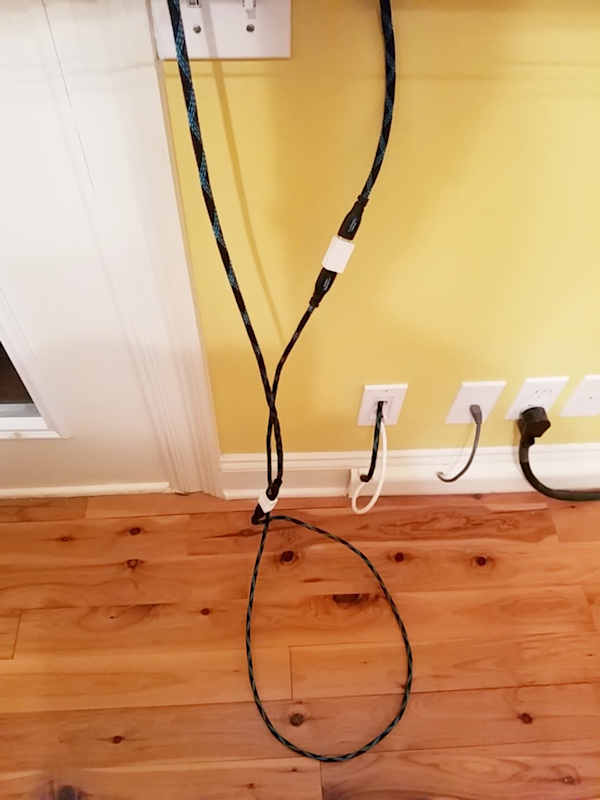 Due to the length that the HDMI connector extended behind the GE wallplates and the length of the Twisted Veins HDMI cable terminations, there was not enough room to do a gentle bend radius and connect the in-wall Twisted Veins cable directly to the backs of the wall plates. 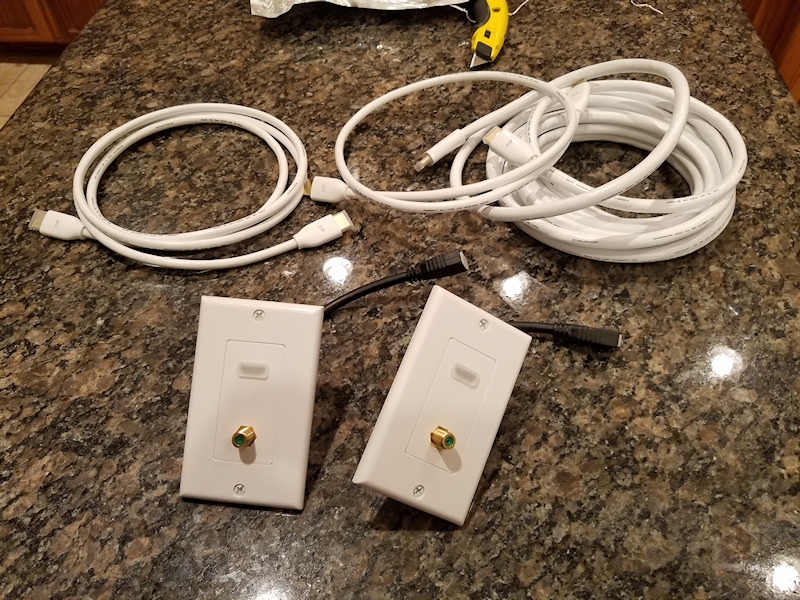 Right angle adapters had to be used on each end of the 6 foot in-wall HDMI cable segment. The Yomyrayhu wall plates came with a 7" HDMI pigtail that allowed me to forego use of the right angle adapters. The combined pigtail length of 14" also allowed me to use a shorter in-wall cable length of 3 feet. Figure 11. Trials with the Monoprice HDMI cables and PxlDrive. During my trials, I found that, with the Monoprice cables and Yomyrayhu wall plates, I didn't need the PxlDrive signal amplifier!! I kept the PxlDrive though. It might be useful in the future. UDP-203 player ==> 20 feet of Monoprice premium certified HDMI cable running inside a baseboard conduit along two walls ==> Yomyrayhu HDMI/F-connector wallplate with 7" HDMI cable pigtail ==> 3 feet of Monoprice premium certified HDMI cable running inside the wall ==> Yomyrayhu HDMI/F-connector wallplate with 7" HDMI cable pigtail ==> Twisted Veins right angle adapter ==> 3 feet of Monoprice premium certified HDMI cable ==> Twisted Veins right angle adapter ==> TV. The right angle adapter at the player was used for strain relief on the player's HDMI jack. I now support the cable connector with a stiff block of foam under it. The right angle adapters used on each end of the cable between the the upper wall plate and the TV are required due to the tight space between the wall and TV. I use an 8 foot Twisted Veins HDMI cable between the master bedroom LG 55" OLED TV and Oppo UDP-203 player. 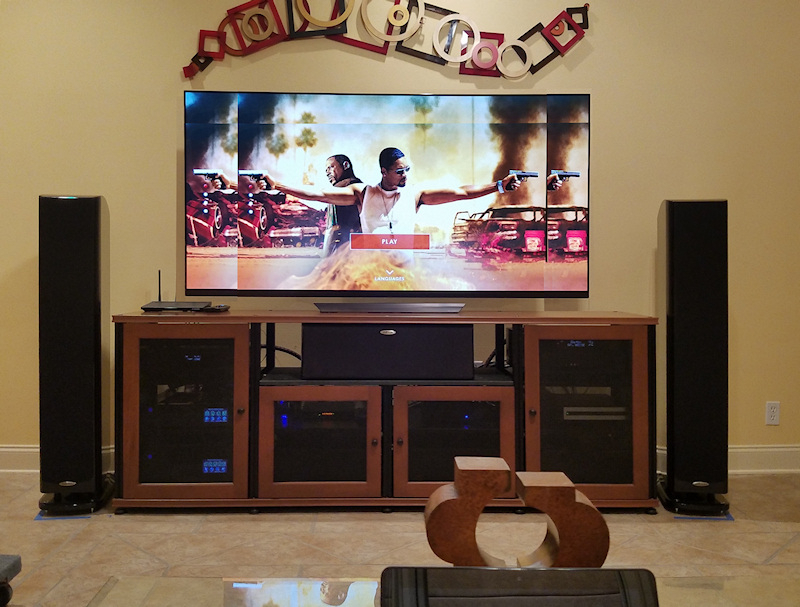 I use two AudioQuest Cinnamon 2 meter HDMI cables in my home theater system, one from the Oppo UDP-205 player to the Yamaha CX-A5100 preamp/processor, the other from the CX-A5100 to the LG 65" OLED TV. So far, the only picture tweaking I have done is turning off power saving and setting picture mode to ISF Day. Most of my UHD titles are movies I already owned in 2K Blu-ray format and had watched many times. However, when watching the UHD version for the first time, the visual experience was so different that I had the eerie sensation of seeing the movie for the first time. There were many times I noticed something in a 4K movie that I totally missed at the theater or watching it multiple times at home in 2K. 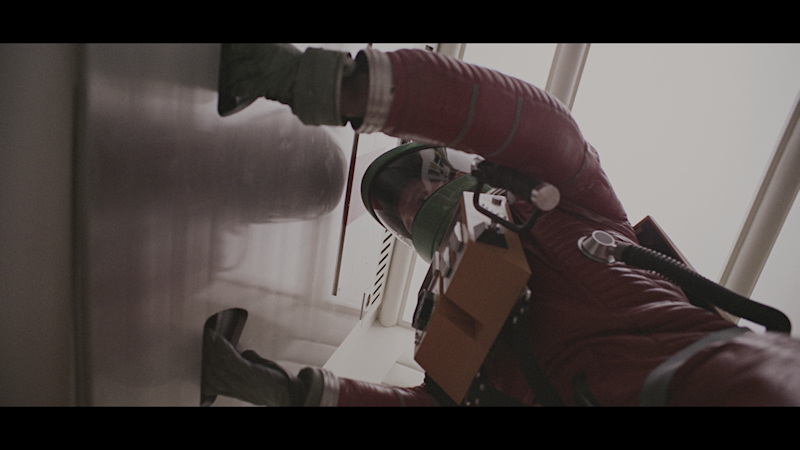 One of the most jarring incidents occurred while watching 2001: A Space Odyssey. Astronaut Dave Bowman's naked left wrist is shown twice while he is in the process of entering the "brain room" of the murderous and insane HAL9000 computer. HAL had murdered the other four crew members and had attempted to murder Bowman by stranding him outside the ship in a maintenance pod. Life support was under HAL's control, hence the need for a spacesuit inside the ship...in case HAL decided to turn off life support. Spacesuits don't work unless they are completely sealed. I checked IMDB and this is listed among the goofs. The video quality of upsampled 2K Blu-ray movies is great. DVDs are...as well as can be expected. One correction...The Hateful Eight was shot in 70mm filmstock. Not 65mm. Oddly enough, the same as 2001. Which I watched the 4Kremaster last night on a friends new JVC 4K projector. "The Hateful Eight was shot with 65mm negative and transferred to 70mm prints for projection. (The extra 5mm print width was used in the past for sound tracks.) Richardson and his crew used two modern 65mm camera models: the Studio 65 and the 65 HS. " Scroll down about 2/3's the way down to the section titled "System 65 Studio Camera"
Thanks for the usual in depth reviews Raife. It sounds like I need to get the 4K 2001:A Space Odyssey. I recently got one of the Oppo UDP-205 players that does excellent 4K. Now I just need a projector to accomplish it in real time.... Audio and video upgrades can be expensive. The only thing I've found to dislike about my LG OLED TVs is the flimsy power cord. I can't even retrofit an IEC inlet into the plastic housing that the power cord connects to. I guess these new "fuel efficient" TVs won't benefit from the noise filtering, hose pipe size power cords that my plasma TVs enjoyed. Figure 14. The 65E8's rear label says it consumes up to 487 watts of power. The Kuro claims up to 524 watts. Both came with the standard 18 AWG 300V appliance grade power cord, but the Kuro's cord was a detachable IEC cord. Figure 15. Really, can I just live? Can I get a TV that allows me to use my favorite power cords? No...not from LG. Figure 16. Big and little. 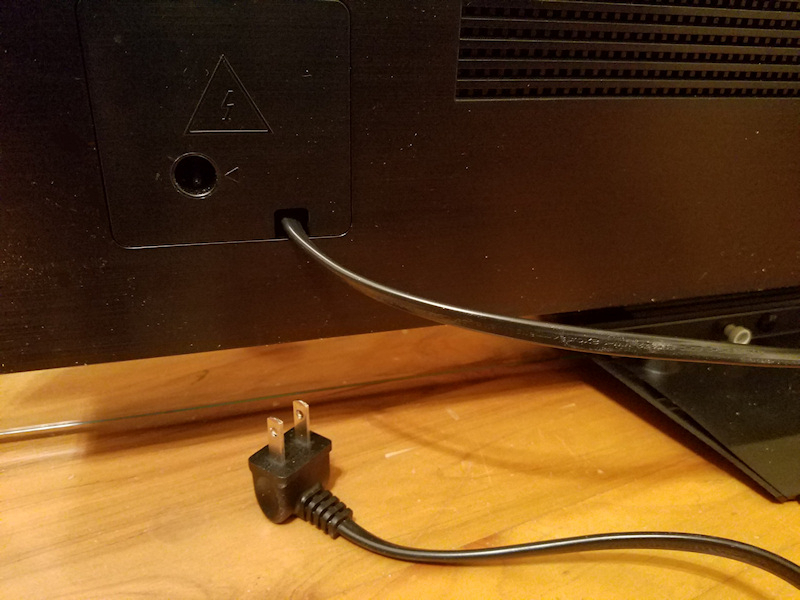 The LG's 5 foot long power cord, which terminates close to the right side of the TV, wouldn't even reach my P10 AC regenerator, and even if it had, the angled plug would have caused the wire to block one of the adjacent receptacles...unless I used an extension cord. The angled plug does come in handy for wall mounting. Figure 17. 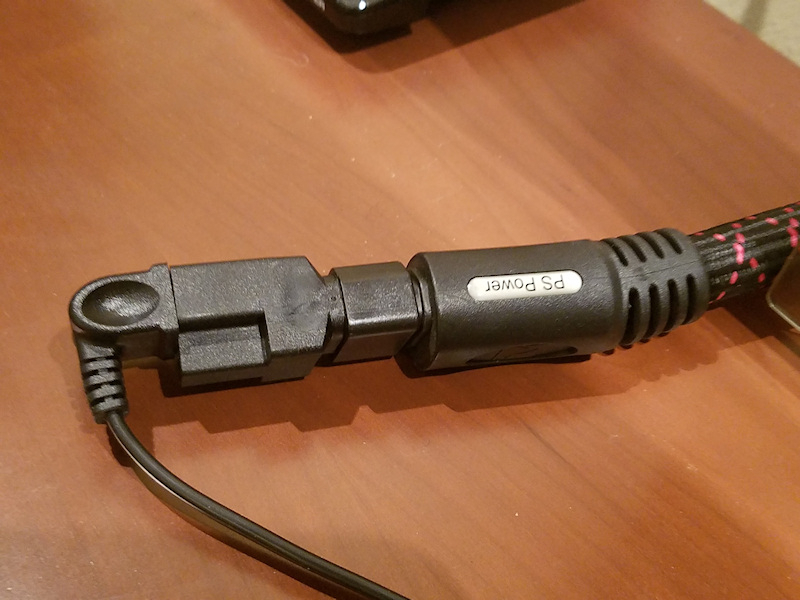 A NEMA-to-IEC adapter allowed me use the existing PS Audio Statement 8 AWG power cord (previously used with the Kuro) as an extension cord for the LG65E8's short cord. Figure 18. Fixed. Not very pretty, but it works. Kudos to LG for saving us the cost of upgrade power cords for our TVs. Figure 19. 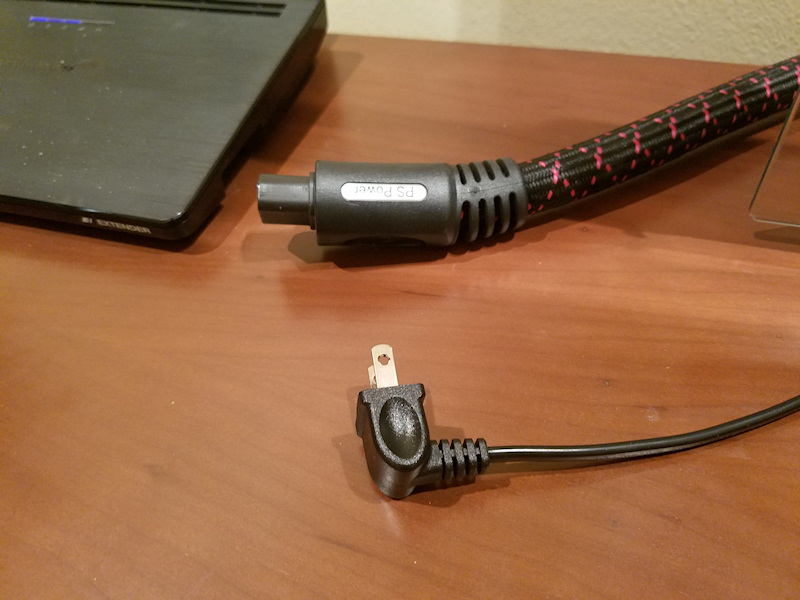 This is the nice PS Audio Plasma power cord (12 AWG) that I would have used with the wall hung LG 55E8 in my home office.